The featured vegetable on my "Twelve Months of Fresh Food" calendar for the month of April is asparagus. 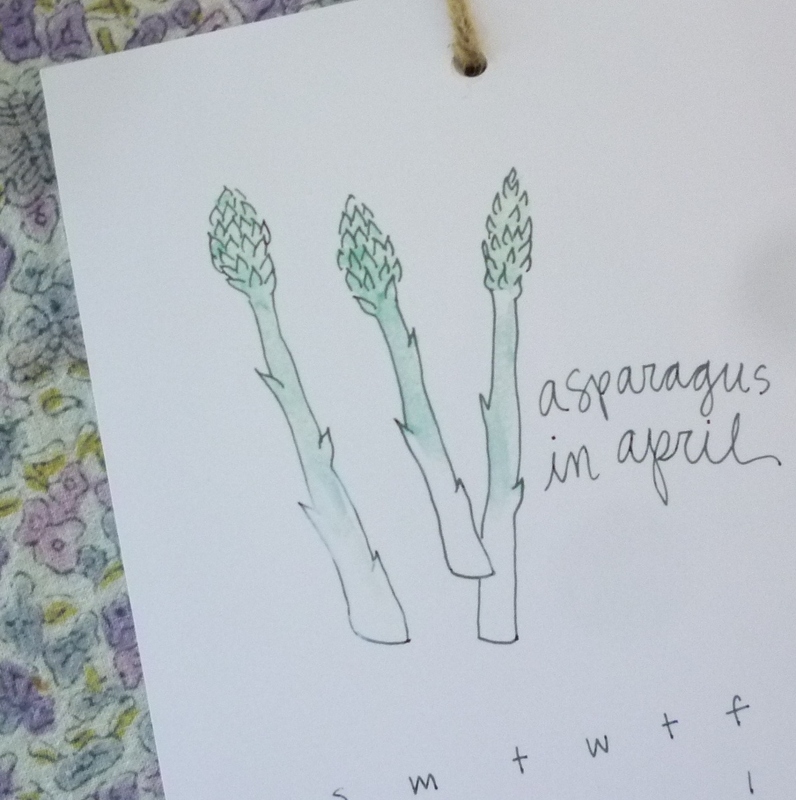 Like last month's featured food (arugula) I have done many posts that feature asparagus...it's probably my favorite spring vegetable. I start buying it as soon as it begins to show up at the market sometime in late March and enjoy it several times a week until the season is over sometime in June. 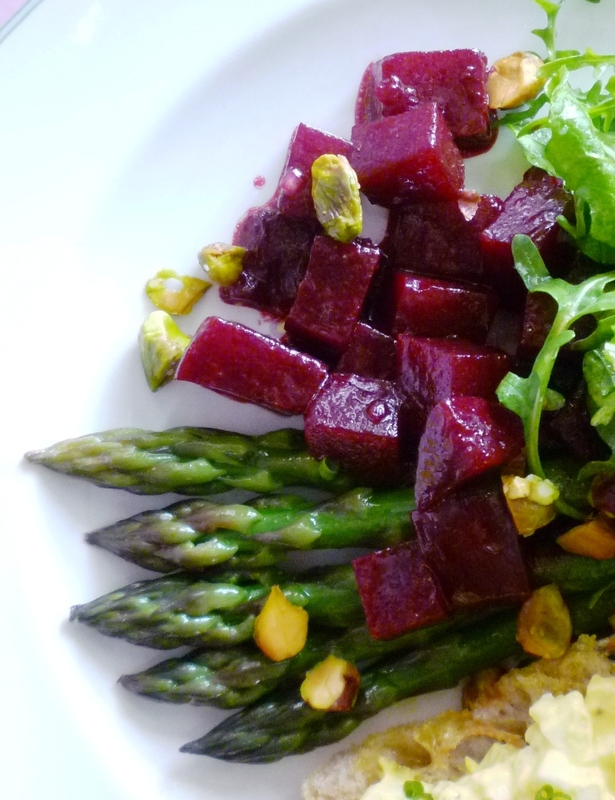 Composed Salad with Asparagus, Beets, Arugula and Egg Salad Crostini..
And it has a special affinity for eggs. It is in this guise—as a simple accompaniment to scrambled eggs—that I wrote about it in a "basics" post a few years ago. In that post I went into detail about how to choose asparagus...how to store and clean it...and then shared my favorite cooking method—a simple étuvée. Besides eggs, asparagus has many other friends in the food world: Cured meats, smoked fish, mushrooms, peas, artichokes, arugula, onions, nuts (especially pine nuts, walnuts & hazelnuts), cheese (fresh and aged goat, Gruyère, Parmesan, Pecorino, Gouda, Fontina, mascarpone, ricotta...), salty/briny condiments (olives, capers, anchovies), Dijon mustard, orange, lemon, butter, cream, olive and nut oils and fresh herbs (basil, thyme, tarragon, parsley and mint...). It is easy to see how you could eat asparagus several times a week for the few weeks of spring and never get bored. 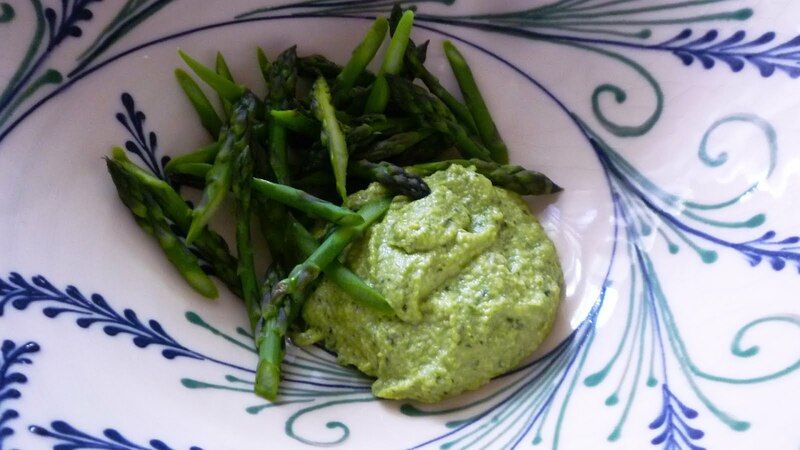 Since I have already written a basics post about asparagus, I thought that for my calendar post this month I would share a preparation that was new to me: Asparagus Pesto. I ran across it while working on an upcoming class. It is from Michael Chiarello's Tra Vigne cookbook...and it is delicious. There are no surprise ingredients in this pesto. It features cooked asparagus puréed with basil, pine nuts, parmesan, garlic and olive oil. 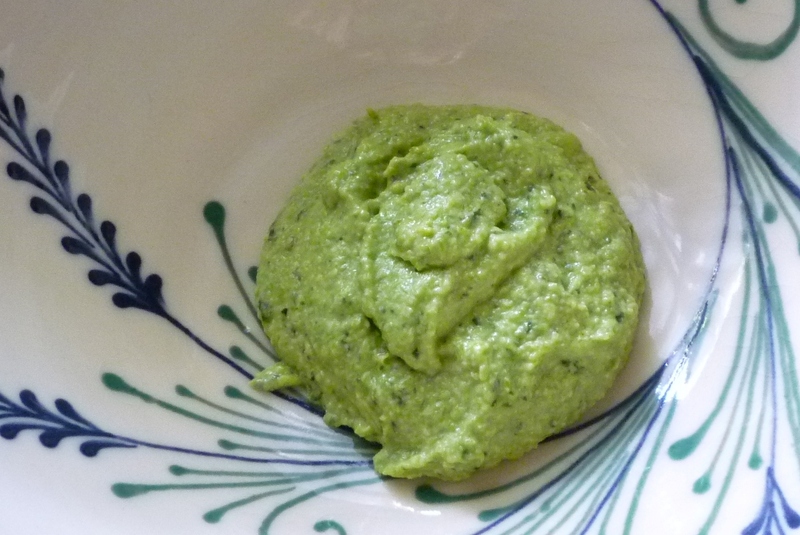 Because of the water content in the asparagus, the resulting pesto is lighter and fluffier than one would expect. It is wonderful on pasta (which is how I'm sharing it today in Chiarello's recipe that is reminiscent of a classic Ligurian pasta with basil pesto, green beans and potatoes). But because of its almost mousse-like texture, it also makes a fine spread for crostini or bruschetta (perfect as an accompaniment to a baked egg....or topped with a poached egg....). 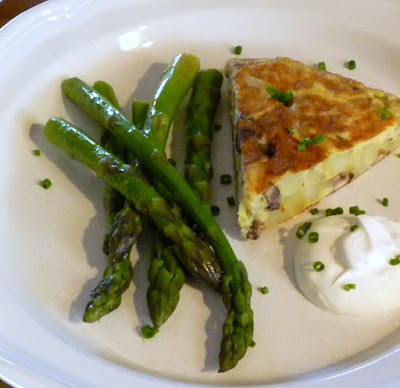 If you have never cooked asparagus before, the recipes in today's post are a perfect place to start. In both recipes the asparagus is simply cooked in rapidly boiling, salted water—the tenderness to which it is cooked is the main difference between the two. 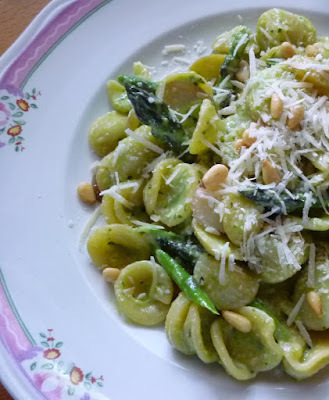 For the pesto, the asparagus should be cooked until it is soft....five minutes or more. I would consider this to be too soft for a side dish or garnish, but it is perfect if the goal is a purée. Don't cook it too long though, or you will lose the bright green color. Furthermore, since the goal is soft asparagus with a bright green color, the recipe directs you to shock the cooked asparagus in a bowl of ice water or under cold running water which will stop the cooking process and "set" the color. 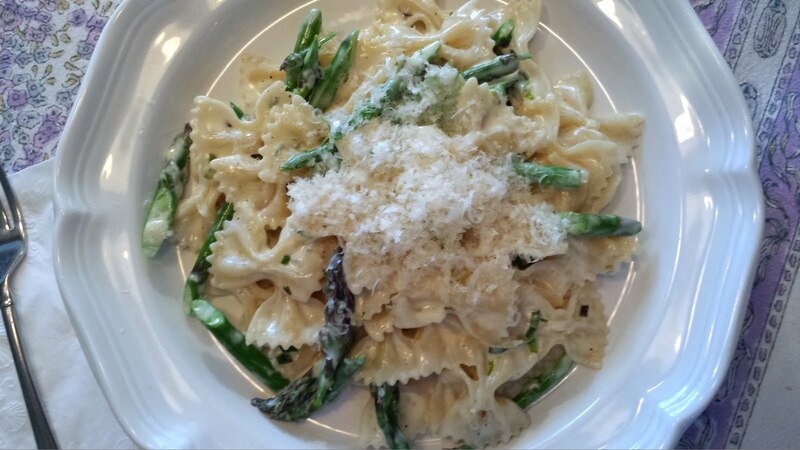 For the asparagus "garnish" in the pasta dish, the asparagus is cooked for less time. You want it to be tender...but to still have texture. The balance between texture and tenderness is up to you. Somewhere around 2 to 3 minutes should be about right, but the only way to know if it is done to your liking is to fish a piece out of the boiling water and taste it. This method—boiling just to the point of tenderness—is the one that you will probably use the most often. It is perfect preparation for asparagus that will be making its way into the many and varied dishes that it will appear in over the next couple of months. Place the potatoes in a high-sided sauté pan with a lid and add water to just barely cover the potatoes. Add a drizzle of olive oil and season with salt. Simmer the potatoes until they are tender; set aside. Blanch the asparagus in 6 quarts of boiling well salted water until just tender (about 2 to 3 minutes). Lift the asparagus out of the water and spread on a towel. Add the pasta to the water and cook until al dente. Drain, reserving some of the pasta water. Place the pesto in a large bowl. Add enough pasta water (about a quarter cup) to the pesto to thin it to a sauce consistency. Add the drained potatoes, the blanched asparagus and the pasta and toss to coat...adding more pasta water (you may need as much as another quarter cup) and/or a drizzle of olive oil as necessary to obtain a fluid sauce. Note: A one pound bunch of asparagus will yield about 8 oz. of trimmed asparagus. (Trim by grabbing each spear of asparagus and bending until it snaps—it will naturally snap at the point where the spear transitions from tough and fibrous to tender. Discard the fibrous ends.) This is the exact amount needed for the pesto and the finished pasta. I like to trim the whole bunch of asparagus, cut it all (at an angle) into 2 to 3 inch lengths and then divide into two piles—making sure all the tips are in the pile that will go into the finished pasta. If the asparagus is very fat, make sure that it is cut on a very sharp angle...and cut the tips in half lengthwise. Use the water that you use to blanch the stems for the pesto to cook the asparagus and pasta for the finished dish. 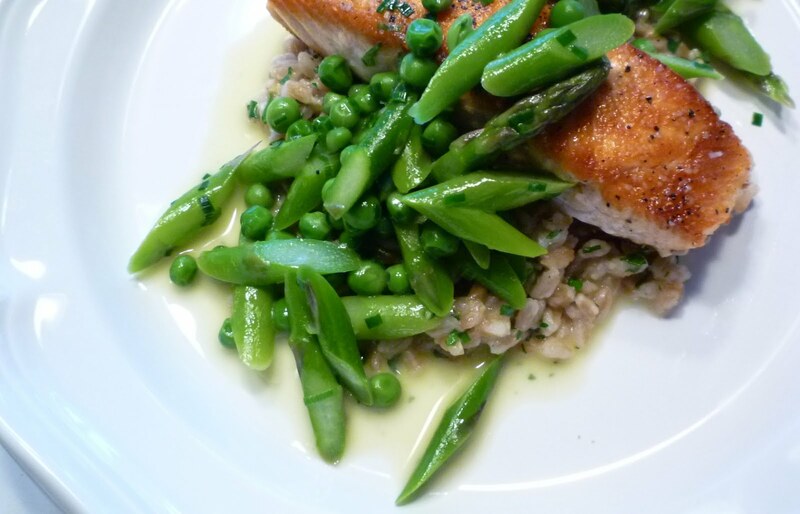 In a pot of boiling, well salted water, blanch the asparagus until quite tender—about 5 minutes. Transfer to a bowl of ice water, or rinse under cold running water, to stop the cooking process. Blot dry. Place the cooked asparagus, garlic, basil and pine nuts in the food processor and process until the ingredients are finely and evenly chopped and beginning to purée (stop the food processor a couple of times to scrape down the sides). With the food processor running, add the oil in a thin stream to achieve a sauce that is the consistency of mayonnaise. If necessary, add a bit more oil. Scrape down the sides; add the cheese and pulse to combine. Thin with water if necessary to achieve a thick, saucy pesto. Add salt to taste. Makes a scant 1 cup. Note: This recipe makes exactly what you will need for 12 oz. of pasta (which will serve 4)...but is easily doubled if you would like to have leftovers for other uses. It will keep, filmed with oil, in a tightly covered container in the refrigerator for several days.